The Internal Revenue Service, not the most popular government agency to begin with, has been in the midst of a scatological squall for the past 3 weeks over their treatment of tea party groups. According to an agency spokesperson, organizations garnered additional scrutiny of their applications for non-profit status for having “Tea Party, Patriot, or 9/12” in the application materials. Non-profit status is granted by the IRS for “social welfare organizations” and federal law puts legal limits to the amount of overtly political things you can do if you are applying to be a non-profit, and thus tax-exempt. In the coverage of this story, now a scandal, there are a couple of important facts that some of the reporting has missed. First is the fact that the tea party is a creation of enterprising political and public relations professionals, constructed to accomplish a political purpose. A study published in the Tobacco Control Journal actually traced the origins of the tea party to “free-market” groups founded by tobacco corporations and the oil industry billionaires David and Charles Koch. 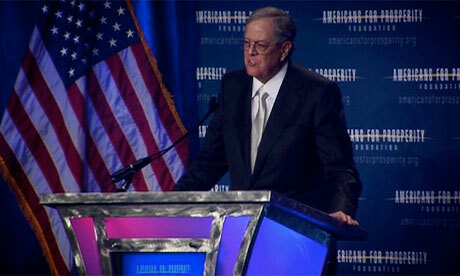 Citizens for a Sound Economy (CSE), was founded in 1984 by the Koch brothers. There is even a tea party website registered to a Koch group in 2005, long before the conservative outcry we now know as the tea party began. The second thing to keep in mind is that the tea party is still controlled by enterprising political and public relations professionals, funded by the David and Charles Koch. 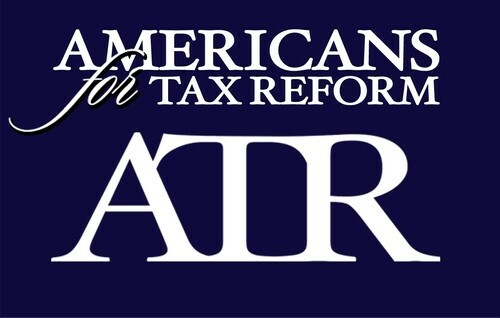 In coverage of the IRS scandal, there were 11 people who were involved in tea party groups quoted about IRS scrutiny. Of those 11, 10 have substantial ties to Americans for Prosperity (AFP). 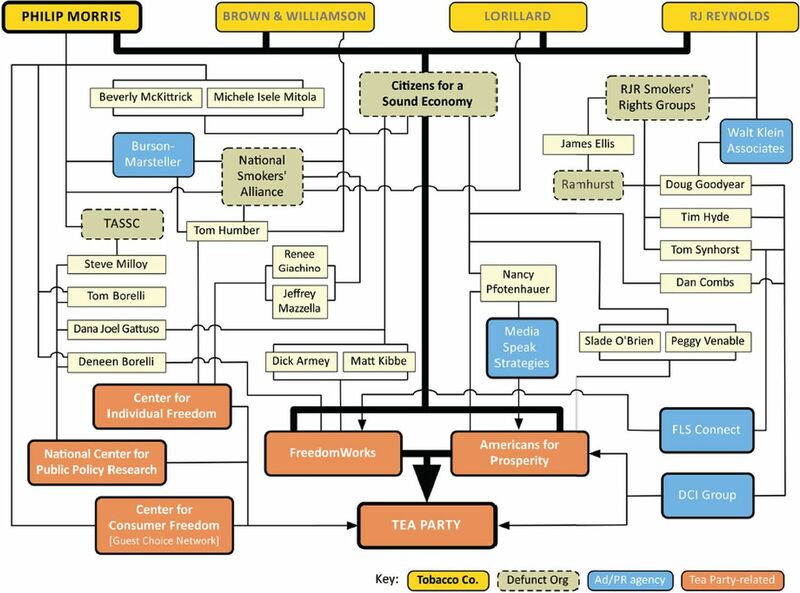 As you can see from the chart above, AFP (also founded and funded by the Kochs), is the direct descendent of CSE - one of the groups who registered a tea party site in 2005. Of those 10 with ties to AFP, 2 actually work for the organization currently. All 10 have received aid from AFP which included help with messaging and communication. The tea party groups that were scrutinized by the IRS are not just separate grassroots citizen groups unfairly accused of political shenanigans, as the Koch associated spokespeople in the media would have you believe. They are one part of a wider political strategy, funded and managed by a very wealthy few. they have uniform and coordinated messages, such as attacking climate science and opposing environmental regulations. As this IRS scandal progresses, it is important to keep in mind that many of the tea party groups in question deserve to have their non-profit, tax-exempt status questioned. The New York Times has already found that several tea party groups investigated by the IRS were engaged in activities that are illegal for tax exempt groups. For the record, Greenpeace and Rainforest Action Network experienced expensive and debilitating audits by the IRS during George W Bush’s presidency. Those audits were most likely at the behest of an Exxon funded front group. AFP coordinated and helped fund the "Waco Tea Party’s Grassroots- Campaign, Leadership & Activist Survival School"
AFP ran tactics and messaging strategy training for Mclaughlin's group in Liberty Township, Ohio. James Taylor, lawyer for The Heartland Institute who claims he's "a scientist by training" because he took college science classes, despite having no degree in science. SHOWTIME's Years of Living Dangerously series just aired a segment featuring James Taylor, a lawyer who has been paid to confuse the public over the reality of climate change, its causes, and its impact on humanity. The Heartland Institute, where James Taylor works, is know for alienating its corporate supporters by comparing people like you and me--assuming you recognize the reality of climate change--to the Unabomber, Charles Manson, and Osama bin Laden. I wish I was joking, but I'm not. "I successfully completed Ivy League atmospheric science courses, so I'm a scientist by training." Who'd would've thought? Apparently if we all want to be scientists, we just need to take a course or two in science! That means there must be thousands, perhaps millions of people in this country who qualify as scientists in James Taylor's world. Unless, of course, you have to take your science classes at the Ivy Leagues--I'll follow up with Taylor about that and let you know what he thinks. After trying to spin his lack of expertise as full credentials, Taylor invokes the long-debunked "Oregon Petition" as supposed proof against climate change, despite the petition's inception as a tactic of the fossil fuel industry, its lack of climate experts as signatories, and its inclusion of fictitious characters like the Spice Girls. 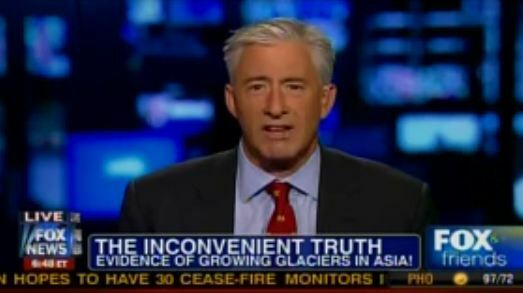 "The scientific evidence is really against them, but they say things so boldly and stridently that it makes some people believe that they must be telling the truth." She's right. It has to take a lot effort, creativity and sheer willpower to make a career pretending the obvious does not exist. Imagine if The Heartland Institute's staff spent their time and money working on real solutions to these problems. Imagine if people like Koch and Murray felt the inevitable need for a shift, and put their skills as businesspeople into solutions-based entrepreneurship. Because of farmers like Pete, and blue-collar wind workers and other citizens who are pleased with getting energy from sources that doesn't poison their air, water or climate, Kansas politicians have now defeated attacks on renewable energy incentives three times in the last two years. More are likely to come, as companies like Duke Energy and Peabody coal don't want clean energy competitors, while executives at Koch Industries and Murray Energy Corporation still combat the science of climate change with the finance of misinformation. That means we will continue to see people like James Taylor, popping up on our TV sets and our state legislatures, lying about whatever he's paid to lie about. Keep your eyes peeled. Heartland Institute lawyer James Taylor, as illustrated in Greenpeace's report on climate change deniers: "Dealing in Doubt"
Americans for Prosperity is the Koch-controlled half of what formerly was known as Citizens for a Sound Economy. A new report in the peer-reviewed academic journal Tobacco Control offers a deeper look at the history of the Tea Party. Commonly thought to be a grassroots uprising spurred by a TV rant in 2009, the report documents how tobacco companies and a front group established by Charles and David Koch were attempting to begin the revolt years earlier. The study, titled "‘To quarterback behind the scenes, third-party efforts’: the tobacco industry and the Tea Party," shows that the Koch front, Citizens for a Sound Economy, set up a website in 2002 for the "U.S. Tea Party." Here is an archived image from that website, which is now owned by FreedomWorks. The two main organizations identified in the UCSF Quarterback study are Americans for Prosperity and Freedomworks. Both groups are now "supporting the tobacco companies' political agenda by mobilizing local Tea Party opposition to tobacco taxes and smoke-free laws." Freedomworks and Americans for Prosperity were once a single organization called Citizens for a Sound Economy (CSE). 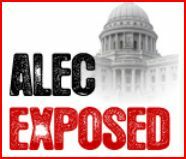 CSE was founded in 1984 by the infamous Koch Brothers, David and Charles Koch, and received over $5.3 million from tobacco companies, mainly Philip Morris, between 1991 and 2004. In 1988, Fink wrote to the Surgeon General to express concern about the Interagency Committee on Smoking and Health’s inquiries into the subject of tobacco and U.S. trade policy. He warned that it would be unwise to suggest any foreign trade barriers, ending, “we hope that you will keep these thoughts in mind as your department discusses U.S. trade policy toward tobacco.” This letter was tracked down by the Checks & Balances Project in the Tobacco Archives, with an addendum from Samuel Chilcote – President of The Tobacco Institute – urging others to follow Fink’s lead and support. Finally, this report might serve as a wake-up call to some people in the Tea Party itself, who would find it a little disturbing that the "grassroots" movement they are so emotionally attached to, is in fact a pawn created by billionaires and large corporations with little interest in fighting for the rights of the common person, but instead using the common person to fight for their own unfettered profits. Americans for Prosperity and FreedomWorks have been successful in co-opting the Tea Party, directing millions in corporate and wealthy donor funding to steer the "grassroots" agenda of Tea Party activists.